Cross Posted from A Newt One with gracious permission from Sonlit Knight. NOTE TO OUR READERS: CURRENT DAILY POSTS FOLLOW BELOW THIS SPECIAL GOOD FRIDAY PIECE. SCROLL DOWN FOR THE LATEST POSTS! The words reverberated through time and space, for they were words cried out to God, from God. This is not contradiction, this is paradox. For in this solemn and sacred mystery is the very meaning of life. 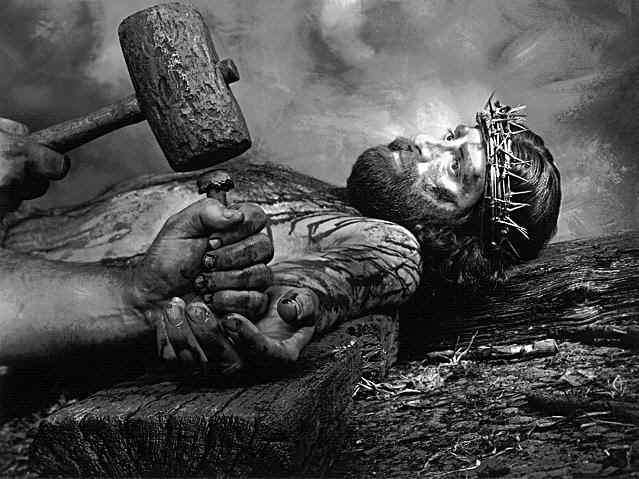 The passion and death of Our Lord is the defining and central theme to all of the fallen age of man. So much so His words ring out in the Prophetic words of the Psalmist. It’s Psalm 22– the one just before the one everybody knows. Here is part of it…. My God, my God, why hast thou forsaken me? Why art thou so far from helping me, from the words of my groaning? O my God, I cry by day, but thou dost not answer; and by night, but find no rest. Yet thou art holy, enthroned on the praises of Israel. In thee our fathers trusted; they trusted, and thou didst deliver them. To thee they cried, and were saved; in thee they trusted, and were not disappointed. But I am a worm, and no man; scorned by men, and despised by the people. “He committed his cause to the LORD; let him deliver him, let him rescue him, for he delights in him!” Yet thou art he who took me from the womb; thou didst keep me safe upon my mother’s breasts. Upon thee was I cast from my birth, and since my mother bore me thou hast been my God. Be not far from me, for trouble is near and there is none to help. The Sorrowful Mysteries are 5 particular events drawn from the narrative of Christ’s Passion, that make up part of a Catholic devotional known as the Rosary. In praying the Rosary’s Sorrowful Mysteries, Catholics attempt to meditate on and delve into the depth of these sacred and sorrowful events and what they mean to believers. I believe that many pious Christians have not truly contemplated the deeper purpose of Christ’s suffering and death and as a consequence come to a distorted interpretation of life, suffering, death and salvation. What does it profit, my brethren, if a man says he has faith but has not works? Can his faith save him? If a brother or sister is ill-clad and in lack of daily food,  and one of you says to them, “Go in peace, be warmed and filled,” without giving them the things needed for the body, what does it profit? So faith by itself, if it has no works, is dead. But some one will say, “You have faith and I have works.” Show me your faith apart from your works, and I by my works will show you my faith. You believe that God is one; you do well. Even the demons believe — and shudder. Do you want to be shown, you shallow man, that faith apart from works is barren? Was not Abraham our father justified by works, when he offered his son Isaac upon the altar? You see that faith was active along with his works, and faith was completed by works,  and the scripture was fulfilled which says, “Abraham believed God, and it was reckoned to him as righteousness”; and he was called the friend of God. You see that a man is justified by works and not by faith alone. even when we were dead through our trespasses, made us alive together with Christ (by grace you have been saved),  and raised us up with Him, and made us sit with Him in the heavenly places in Christ Jesus,  that in the coming ages He might show the immeasurable riches of His grace in kindness toward us in Christ Jesus. For by grace you have been saved through faith; and this is not your own doing, it is the gift of God —  not because of works, lest any man should boast. Once again, paradox is at work. For though it was Moses’ staff that turned the Nile red with blood, it was not Moses who did it. Though it was Trumpets of Joshua’s band that brought down the walls of Jericho, it is not Joshua who did it. Though the Virgin Mary brought forth the I Am Himself, it was not by Mary’s doing that this miracle was brought forth. So what of these sorrowful mysteries I mentioned? In them is found the answer. For if salvation is of faith through works, how can anyone be saved? When the disciples asked this very question…..
Jesus excels at making the impossible possible…..even putting salvation within the reach of sinful men. For a human being cannot achieve salvation by human acts, only by Divine acts. How can a human being accomplish Divine acts??? He can only do so because He who was both human and Divine, sanctified the human act and made it Divine. Jesus was not baptised because He needed to be. He was baptised to take a human act- being immersed in water- and attaching a Divine action to it. Now, through Baptism, we can receive sanctifying Grace. Before, you would only get wet. Jesus did not pray the Our Father merely because it sounded good. By simply voicing it, it became the Word of God. All throughout the New Testament, we see evidence of purely human actions that now have Divine value. Here are but a few…. Then Peter and John placed their hands on them, and they received the Holy Spirit. Time after time, what appear to be simple human acts performed by human beings have a supernatural component fused to them because these acts were sanctified and made holy by the God-Man. The Bible tells us that He was like us in all things except sin. Why? Have you ever thought about this? Did God, the Omniscient One, need to experience life as a human being to understand it? Hardly. Then why? Why did Jesus need to come to us, be baptised, work, learn, teach, pray, fast, minister, empathize, experience fear and rejection and grief and suffer and die a horrible death? Did He do all these things so that we would not have to? Not so! The Bible definately does not teach that. In fact, it teaches the opposite! For, while Jesus was baptised, learned, taught, prayed, fasted, ministered, empathized, experienced fear and rejection and grief and suffered and died, He admonished each and every one of us that we would-to greater or lessor degree- experience each of these things. This is where the so-called “prosperity gospel” preachers get it so wrong. “Follow Jesus” they say, “and you will know only joy and peace”. Jesus promised something very different. Jesus promised that the price of following Him was a Cross that you would have to carry. Jesus promised that you would be hated and reviled by mankind and that you would have to live a life that shunned the pleasures of this world. In short, Jesus promised that suffering would come to those who believed and that only those who endured to the end would be saved. Well….that doesn’t sound like much fun! It certainly is difficult to reconcile with the idea of a God who came to earth to suffer and die, as a free gift of salvation. It almost sounds like a contradiction. It almost sounds like God is going back on His word. It almost sounds like God is cruel. Why would God desire the very followers He Redeemed at an incalculable price and who accepted Him, suffer needlessly at the hands of the very ones who rejected Him? To understand, you must re-orient your thinking and understanding of who Jesus was and what He did for you. He did not suffer so that you would not have to suffer. For if He did some very special people to me were seriously short changed. Jesus again did not suffer for the purpose of eliminating suffering from your life. Jesus suffered to sanctify suffering itself and make it holy so that even that which the devil intends for evil can be used for good. Once again, the sheer depth of God is explored within the mystery of paradox. For it is right and just and logical that we would attempt to avoid suffering, yet suffering, if it must come, is not in vain. For even that which hurts us, can help us. Is it God’s will that we suffer? hardly. It’s the devil’s will. The passion of Christ and the five sacred mysteries that explore it teach us the very thing Satan uses to destroy you can be used by God to save you. The same words. Listen to me. The same words King David cried out. The same words the Savior cried out. For God in His unfathomable mercy experienced the perception of His own rejection and the sorrow of isolation even as He saw all and knew all. The inexpressible mystery of paradox. Jesus did not forsake you, little one, though it seems so painfully clear that He did. Where was He in your suffering? Right in the middle of it. When you pleaded with God to protect you from the thing you were so fearful of, He was on His knees in the Garden of Gethsemane sweating blood and pleading that the cup be taken from Him. While you were being taunted and ridiculed and made to feel small, insignificant and worthless, He was before the tribunal of Pilate being spit upon, kicked, mocked and crowned with thorns. While you suffered horrible pain unjustly, He was there, being scourged and crucified. As you have gone through life carrying a burden, He was carrying His cross. Many believers don’t want to talk of these things, preferring to concentrate only on the Resurrection. Many of my Christian friends point out (and rightly so) the suffering and death is completely powerless without the Resurrection. Point conceded. Do not forget, however, what magnifies the Light and power of the Resurrection is the sheer darkness from which it rose. The disciples had placed all their faith in a Savior only to watch him arrested for crimes He wasn’t capable of committing, subjected to a gruesome, horrific torture and murder and laid in a tomb. Everything they believed was destroyed, everything they hoped for was obliterated…or so they thought. The power of the Resurrection is even the most horrible darkness can be followed by the Light of the Son. This life will eventually bring misery and death to each of us. For every possession you have will be lost and every relationship you have will be brought to an end. No level of power or money can buy you another second when the Angel of Death comes to call upon you. This is just reality. Do not despair. Do not give up. For those who have accumulated great fortune in this world, age and death are only that much more painful a separation. Do not assume the suffering that has been visited upon you means God doesn’t love you. Remember, you cannot have a Resurrection without the Crucifixion. Does this mean that you must be crucified? Heavens no! It means that you must take up your cross (Matthew 10:38) and unite your sufferings with His (Colossians 1:24). How do you do so? Very simply-by saying and embracing those 4 difficult and powerful words: Thy will be done. and remembering the sorrow of Friday is fleeting; the Joy of Sunday is everlasting. Also posted at Digg! here and GOP Hub here. This came in my email from my friend Greg and he asked me to pass it on. If it’s not one thing with these nutters and looney tunes, it’s another! Go sign the email and register your outrage! Please help us get this information into the hands of as many people as possible by forwarding it to your entire email list of family and friends. A week later, Dean and the DNC issued another statement concerning Easter: “Easter Sunday is a joyful celebration. The holiday represents peace, redemption and renewal, a theme which brings hope to people of all faiths.” The DNC refused to even mention Jesus or the Resu rrection, the very heart of Easter. The DNC took one of two unique Christian holy days and turned it into a politically correct “religious” day. The DNC treated Easter as if was not unique to the Christian faith, and made it into a nondescript, universal, nonexclusive religious celebration celebrated by every religion in the world. The DNC greeting had not one word to say about the Resurrection, but said Easter represents “peace, redemption and renewal.”They define the Jewish holy day correctly, as they should. But to keep from offending any non-Christian, the DNC takes the Christian Easter and defines it in a politically correct manner. Intentionally offending Christians is something the DNC doesn’t mind doing. Forward this to Christian friends. If you think our efforts are worthy, would you please support us with a small gift? Thank you for caring enough to get involved. P.S. Please forward this e-mail message to your family and friends! HE IS RISEN! God Bless Johnny Hart and his FEARLESSNESS in Proclaiming his Faith! Today’s offering from Johnny Hart is as thought-provoking as all his Easter offerings. It’s a welcome breath of fresh air for he is fearless in proclaiming his love of Jesus and what Jesus has done for the world. The fact he boldly prints it in a cartoon format allows both adults to ponder and think and children to learn about the Saviour. Too bad the true meanings he portrays fly over the heads of the MSM and the liberals–they could definitely learn something. Maybe that’s what they’re afraid of. Enjoy and rejoice for JESUS is RISEN! 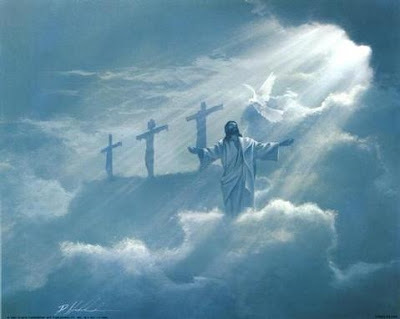 Filed under: Easter, Jesus, Johnny Hart, Liberals |	Comments Off on HE IS RISEN! God Bless Johnny Hart and his FEARLESSNESS in Proclaiming his Faith!